﻿Wild Thing: When Is a Rabbit Not a Rabbit? ﻿﻿﻿﻿﻿Despite its name, a jackrabbit is actually a hare. ﻿﻿﻿﻿﻿﻿﻿﻿Bugs Bunny’s not a rabbit? Nope, looking at the length of his ears and legs, he’s most probably a hare. The difference between hares and rabbits is not only the length of their ears and legs, but also the way they look when they’re born. Hares have precocial babies, which means they are born fully haired, eyes open and ready to hop. Rabbits have altricial babies, which means they’re born hairless, eyes closed and totally dependent on mom. The jackrabbit we see in Texas is the black-tailed jackrabbit, Lepus californicus. Like Bugs, he is not actually a rabbit, as his name implies, but a hare. Early settlers of the Southwest noted the animal’s long ears and called it a “jackass rabbit,” which was later shortened to the current common name. The black-tailed jackrabbit can be found throughout most of Texas and as far west as California. As the name implies, it has a black stripe on its tail that extends up the back, but otherwise is a grayish color on top and white underneath. A jackrabbit can reach a length of 24 inches and weigh from 3 to 9 pounds; females are larger than the males. Their long legs allow them to outrun most predators — they can reach speeds of 35 mph in zigzag fashion. 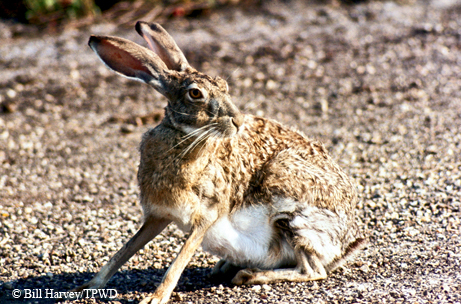 Pound for pound, jackrabbits can outjump any critter in these parts, covering approximately 20 feet in a single bound. Those long ears are used not only for hearing, but also as a cooling system, dispensing body heat on Texas’ hot days. Jackrabbits breed throughout the year and can have anywhere from two to six litters per year with an average of three or four leverets (baby hares) per litter. The gestation period is about 45 days, and once the babies are born, it’s not too long until they are out on their own. They grow rapidly and reach adult size in about seven to eight months. Jackrabbits do not dig burrows; they make depressions in the ground, usually under a bush, and use these areas to give birth or rest in during the day. A jackrabbit’s diet consists mostly of woody vegetation during the winter and a feast of grasses, weeds and cacti the rest of the year. They get most of their water requirements from the vegetation they eat. It takes 128 jackrabbits to consume as much vegetation as one cow or seven sheep.